Preheat oven to 350°F. Line a baking sheet with either parchment paper or nonstick aluminum foil. Lay two of the tortillas on the baking sheet. Sprinkle 1/4 cup of the shredded cheddar cheese on each of them. Top with 1/4 cup diced turkey breasts, each, and 1/2 of the bacon. Top with the remaining cheese, divided easily between them. Cover with a second tortilla each. Slide the tray into the oven and cook for about 10 minutes, until the cheese is all melted. Remove from the oven and let sit for 5-10 minutes before slicing. Serve immediately. These are particularly good with barbecue sauce. When it comes to Thanksgiving leftovers, my family and I get tired of eating the same mix of turkey, potatoes, gravy, stuffing and cranberries pretty quickly. That’s why recipes that reinvent the taste totally rock. Reimagining the leftovers is essential for us. So, when it comes to Thanksgiving, we typically eat the whole meal again once as leftovers. Then, the individual parts of the meal become other dishes. Mashed potatoes top a turkey shepherd’s pie (which I freeze until mid-December). Cranberry sauce is used in thumbprint cookies, coffee cakes and more. As for the turkey – it goes into that shepherd’s pie. It’s also chopped up and used in salads, pastas, soups … and dishes like these Baked Turkey Quesadillas. These are fabulous. You have the sharp cheddar, juicy turkey and a touch of salty bacon all tucked between tortillas. And because it’s baked, you don’t have to worry for a second about spilling the contents of these stuffed tortillas when flipping them. Easy, easy, easy. 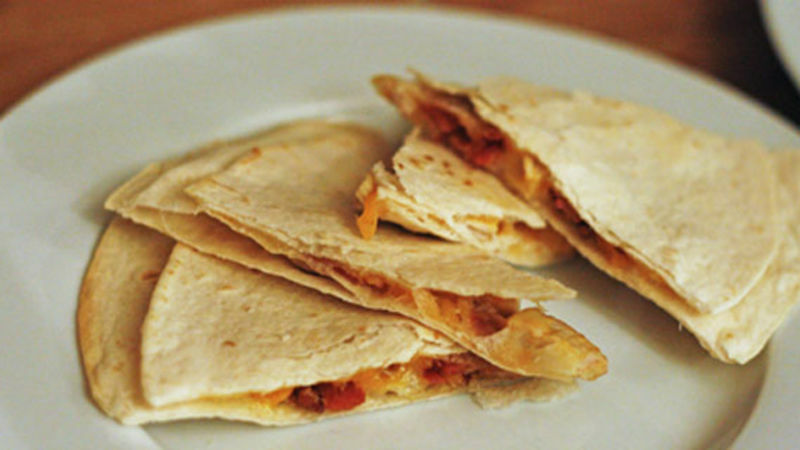 Serve these delicious quesadillas with barbecue sauce for dipping (they are fabulous with it!). And be sure to have that salad, too. The salad totally rounds it all out.